Thank you to judge Bart Woodstrup and students from the 16 area high schools who participated in the 2019 NEIA High School Art Show. 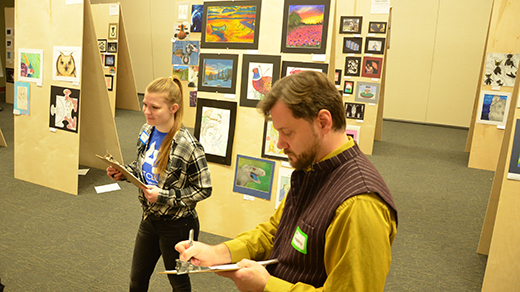 Teresa Hageman, a Graphic Design major and Turkey Valley High School graduate, is pictured assisting Woodstrup, an associate professor of Time Arts at Northern Illinois University in Dekalb, Illinois, during the Wednesday, March 20, judging. Approximately 200 high school artists were registered from Waukon, North Fayette Valley, Crestwood, Starmont, Edgewood-Colesburg, Charles City, Turkey Valley, Center Point-Urbana, Postville, MFL Mar Mac, Central, Riceville, New Hampton, Charles City, Clayton Ridge and South Winneshiek schools.